Prior to being appointed as the Secretary of Labor in 1933, Frances spent 15 years as a member of the Consumers’ League and as an industrial commissioner in New York State. In 1918, she had accepted Governor Al Smith’s invitation to become the first female member of the New York State Industrial Commission. In 1926, she became the chairperson of the commission. During her years as the member and later, as the chairperson of this commission, she championed better working hours and conditions, compensation for work-related injuries, and a minimum wage. An article titled ‘Average Pay is $13, says Miss Perkins’ which was published in the New York American on November 19, 1929 stands as a testimony to Frances’s endorsement of the minimum wage issue. While Frances’s idea about a reasonable living wage was not fully realized until she became the Secretary of Labor, as this article shows, she had begun advocating for it earlier in her career. While cataloging Frances Perkins’s documents at The Brick House this summer, I’ve discovered articles and correspondence on the history of the Perkins family. Among the articles I’ve found was one regarding the Perkins & Butler retail business. According to an article dated 1913, the Perkins & Butler retail business was the largest wholesale paper and twine dealer in Worcester, Massachusetts. Besides carrying paper and twine, their store also carried a line of stationery. The business was founded by Frederick W. Perkins, Frances Perkins’s father, in October 1, 1882 and was initially known as F.W. Perkins Wholesale. He advanced his business venture alone until 1900 when he admitted George S. Butler to partnership. The business then continued under the firm name Perkins & Butler. However a letter from George Butler’s attorney to Frances Perkins dated 1916 shows that, with the death of her father, the partnership was automatically dissolved under the Massachusetts law. It became the duty of Frances and her mother to liquidate the business and dispose of the assets or to simply accept a payment worth Frederick’s share in the retail business from Butler and let him continue the business. In the letter, attorney Willis Sibley suggested to Frances that her mother “should get her money and interest out of the firm” as he did not believe “it was policy for a woman to continue with business with which she could not conveniently keep in touch.” Frances Perkins, who strongly believed in women’s equality, must have found such a remark to be misogynist as well as disrespectful. By 1916, Frances had already graduated from Columbia University. After receiving her degree, she was appointed the secretary of the Consumers’ League in New York, where she worked for better conditions for working men and women. While we don’t know her actual reaction to this letter, Frances, who defended the labor rights of both men and women, can be imagined to have deemed it appalling. At the same time, such discouraging comments made to her about women may have actually strengthened her will to succeed. Frances Perkins's grandson, Tomlin Perkins Coggeshall, looks on as executive director Barbara Burt reads congratulations to honorees Shenna Bellows, Selma Botman, Laura Fortman, and Elaine Tuttle Hansen. 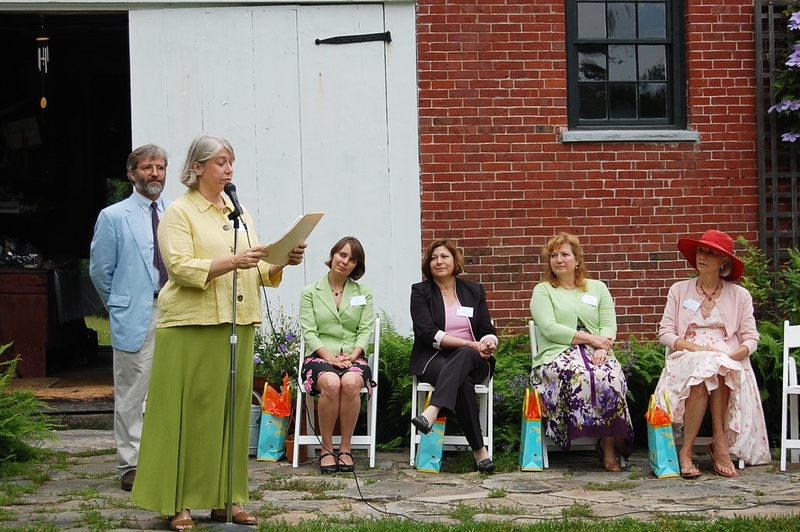 Five Maine women leaders were honored at the event. The honorees were Maine Civil Liberties Union (MCLU) Director Shenna Bellows; Commissioner of Labor Laura Fortman; Bates College President Elaine Tuttle Hansen; University of Southern Maine (USM) President Selma Botman; President of Maine Senate Elizabeth Mitchell; and Congresswoman Chellie Pingree. While Senate President Mitchell and Congresswoman Pingree were not able to attend the event, a representative of Congresswoman Pingree received the honor on her behalf. Congresswoman Pingree sent a letter in which she celebrated the Frances Perkins Center and said she was joining us at this event in spirit. In her letter, she acknowledged that Frances brought a deep commitment to improving lives of all Americans by playing an instrumental role in creating Social Security, unemployment insurance and a federal minimum wage. She emphasized the importance of an organization such as the Frances Perkins Center that is dedicated to furthering her legacy of commitment to working people. Congresswoman Pingree also reminded the garden party attendees that universal healthcare is the one unfinished piece of Frances Perkins’s agenda for social and economic justice. Senator Olympia Snowe sent her best wishes to the Frances Perkins Center and congratulated the six women leaders. She described Frances Perkins as exemplifying Maine’s legendary work-ethic, can-do spirit, and hallmark independence. Senator Snowe envisioned the center as a vibrant epicenter for research and the thoughtful interactions and deliberations among students, scholars, and policy makers whose common inspiration is founded on the magnificent life of Secretary Perkins. Besides MCLU Director Bellows, Commissioner of Labor Fortman, Bates President Hansen and USM President Botman, the other distinguished guests at this event were New Deal historians Dr. Christopher Breiseth and Neil Rolde as well as Kirstin Downey, author of The Woman Behind the New Deal and Karenna Gore Schiff, author of Lighting the Way: Nine Women Who Changed Modern America.